ANAHEIM, CA--(Marketwired - Jan 14, 2014) - A host of architectural choices, including new detached homes and contemporary townhomes, coupled with private, resort-style recreation make Casita at Colony Park a must-see opportunity. Presented by well-respected homebuilder and developer Brookfield Residential, this exciting collection offers prices from the low $500,000s, plus the financial benefit of no Mello Roos fees. Now is the time to experience Casita, one of the final new neighborhoods at Colony Park and get moving to the NEW Anaheim. "Casita's floorplan selection gives homebuyers the chance to enjoy the privacy of a detached home or the convenience of modern townhome in a dynamic urban setting. With comfortable, efficient interiors enhanced with spacious living areas and large secondary bedrooms, as well as private yards and courtyards for outdoor dining and entertainment, this neighborhood can accommodate a range of lifestyles and expectations," said Rocky Tracy, Vice President of Sales for Brookfield Residential. "The inclusion of granite kitchen countertops, stainless steel appliances and a range of eco-friendly amenities further underscore the inherent style, smart planning and fine detailing that grace every Casita home design." Casita presents an impressive selection of detached homes and townhomes that offer 3 to 4 bedrooms and 2.5 baths in approximately 1,384 to 1,934 square feet; two-car garages are standard. The neighborhood's low HOA dues and eco-smart features that can reduce utility bills by approximately 25%-40% when compared to neighboring cities add to one's overall savings. Orange County homebuyers are encouraged to visit Casita soon to explore the beautiful models on display and to log on to www.BrookfieldSoCal.com to register their interest. Private resort-style amenities to relax, play and socialize with friends and neighbors are just outside your Casita front door at Colony Park. Exclusive recreational centers feature an incredible display of amenities that include (per location) saltwater pools, covered outdoor pavilion with barbecues, a green park, indoor-outdoor entertainment areas, spa, outdoor fire pits, bar, barbecues and a lounge for parties. Colony Bark, a community dog park are both planned for the future. The Anaheim Packing District is just a short stroll from Casita, a dynamic gathering place that includes the Packard Showroom, where the popular Anaheim Brewery and Umami Burger are now open, plus The Farmers Park, an outdoor marketplace that hosts an array of community activities. Homeowners are looking forward to spending a casual weekend afternoon enjoying an international display of culinary fare at the future Packing House. For more information, visit www.Anaheimpackingdistrict.com. The Historic Colony District also includes cafes, art and entertainment opportunities that encompass the Muzeo Museum and Center Street Promenade. Colony Park is easily accessible to three major freeways, presenting an easier work commute to major employment centers in Orange County as well as Los Angeles, San Diego and the Inland Empire. To visit Casita at Colony Park from the 5 Freeway, exit Lincoln Avenue and head east. Turn right on Olive Street and follow the signs to The Welcome House. The Welcome House is open Friday-Monday from 10 a.m. to 5 p.m. and Tuesday-Thursday by appointment. 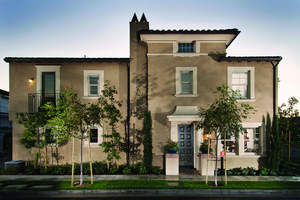 For more information on Colony Park, call 888-448-4550, or visit www.BrookfieldSoCal.com. Discover Casita's detached homes and stylish townhomes within the amenity rich community of Colony Park.